Another potential challenge is finding a death listing in a weekly paper. If the person died right after the latest edition of the paper was published, they may not be listed in the next week’s edition, due to other news overshadowing it. If, however, the person for whom you are searching was a prominent citizen of the area, there may be an article such as this one from the Jasper Courier from Jan. 13, 1922. The entire article is two columns long. Because Mike Sweeney had been a State Senator, he was given a large obituary in the newspaper. Unfortunately, this same edition of the paper did not mention any other deaths occurring that week in the Jasper area. As an example of a later newspaper, the Indianapolis Commercial had vital records columns listing the name of the deceased, the date of death, the age of the person, and the cause of death. The Commercial was primarily a business paper, but this column for deaths is very useful to those searching for obituaries. If you find a listing in the Indianapolis Commercial, you will need to choose another Indianapolis newspaper from that time period, such as the Star or News, and look near the date listed in the Commercial for a more detailed death notice or obituary. If the death occurred around 1965 or later, you can use the Social Security Death Index, available on Ancestry.com (available to use for free at ISL), in order to find a date and location of death. Sometimes, the SSDI only lists the month and year of death, but at least you will have a place to start. Ancestry.com now has links to findagrave.com, an online database to which volunteers can submit gravestone and cemetery photos and obits. When you are conducting a search on Ancestry.com, sometimes a link to findagrave.com comes up as a result. Check the link to see if either the date of death is carved on the tombstone, or if an obit has been submitted. To save yourself added labor, you might try simply entering the person’s name and location of death into a search engine such as Google. Some websites may have free access to obituaries. There may be a citation from a newspaper, as well. Hopefully, your Indiana ancestor will have a detailed obituary that you will be able to easily find. If this is not the case, hopefully at least one of these tips will help. This blog post was written by Leigh Anne Johnson, Indiana Collection Librarian, Indiana State Library. For more information, contact the Indiana Collection Division at (317) 232-3670 or “Ask-A-Librarian” at http://www.in.gov/library/ask.htm. 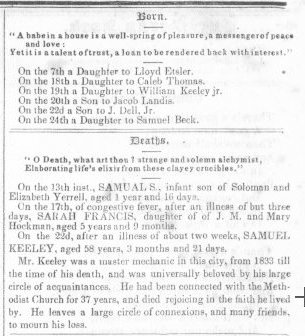 This entry was posted in Indiana Division and tagged Death Notices, Indiana, Indiana Division, Indiana State Library, Newspapers, Obituaries by indianastatelibrary. Bookmark the permalink.